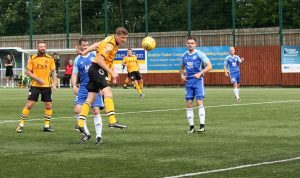 The league opener was a tough one to take for Annan Athletic, after taking the lead to title favourites Peterhead on the half hour mark through Peter Watson they looked to be on track for the first 3 points, but to concede 2 goals in the final five minutes left the Black and Golds in shock as to how they came away with nothing. With the absence of James Creaney, Scott Hooper stepped back into the starting line up with Jack Brannan moving to left back, Rabin Omar and Ellis Pearson had suspensions to carry out from last season, Murphy brought in two trialists for a place on the bench. Peterhead won the toss and forced Annan to switch sides which meant the home side shooting towards the usually preferred clubhouse end in the first half. Ryan Stevenson was the first to have an attempt at goal with an effort from 25 yards but the shot was wide of the target. Jamie Stevenson then tried to open the scoring following a Peterhead corner but the shot was blocked in front of goal. Player/Manager Peter Murphy showed some class with a neat ball over the top for Aidan Smith but the striker was too quick for the offside trap. The visitors then had a chance as Gibson whipped a free kick into the box but Jordan Brown blasted over the bar from close range. The impressive Owen Moxon played a clever ball to Stevenson who had a decent attempt at goal but was high of the target. Moxon again placed a terrific ball over the top for the run of Smith, the shot headed through the keepers legs but took a slight deflection out for a corner. The initial corner was cleared from Peterhead but when crossed back into the area, skipper Peter Watson was there to head the hosts into the lead. Gibson tried to respond for the Blue Toon but Annan goalkeeper Atkinson pushed it past the post. Then it was the visitors that had their goalkeeper to thank as Annan hit their best spell. Peter Watson’s shot was heading for the back of the net until Fleming pushed it onto the post, as the ball came back in Watson got another header towards goal, but to be denied by Fleming again. Blue Toon keeper Fleming then pushed the Annan corner off the goal line before being called into action again to save Aidan Smith’s attempt in the 41st minute. The hosts were unlucky to not have at least another goal to their tally at the half time interval. Peterhead were expected to up their game in the second half and Atkinson had to be alert to save Brown’s volley from the edge of the box in the 51st minute. Ryan Stevenson then showed some brilliant control before setting up Aidan Smith but Fleming again saved to deny the Galabankies a second goal. Sinnamon tried to beat the on form keeper but the shot was pushed out for corner. Peterhead boss Jim McInally made a major change in the 58th minute with a triple substitution. The game then swung in favour of Peterhead as they stared asking questions of the Annan goalkeeper. Riley went close but Atkinson got a strong hand to push onto the post. Gibson tried another free kick but the keeper collected well. The blow came in the 85th minute as Annan failed to clear a corner and David McCracken made no mistake shooting into the bottom corner. As the game looked to be heading for a draw Jamie Stevenson had other ideas as he scored an absolute screamer to hand the visiting side all 3 points. With Annan’s back to the wall, the ball fell kindly to Stevenson 35 yards from goal and he hit an unstoppable shot into the top corner past Atkinson. With numbers still short in the Annan squad the manager still has a lot of work to do but there’s plenty of positive signs with the way the new group of players are gelling together and performing.